Gymnastics has been around for more than two millenniums at this point. Back in ancient Greece, teachers trained their students in gymnastics as a part of their education. Today, gymnastics is still a great way to interest your child in sports and motivate them to stay physically active for years to come. If your child is already into gymnastics, a great way to help them advance to the next level is to get quality gymnastics equipment for home use. Since, according to SGMA data, participation in gymnastics has grown 18% since 2009, this is a great time to get your child into it. Now, when it comes to children’s gymnastics equipment, the selections can vary considerably depending on your child’s age and skill levels. In order to help you pick the right equipment, I’ve compiled a list of best bars, beams, and mats for young children. Even if your child is new to gymnastics, this equipment will let them train safely. Can be elongated up to 12 ft.
A gymnastics bar will not only provide your child the training he or she needs, but it can also be a lot of fun. Most beginners usually gravitate towards mini-bars and more advanced children often use them for strength training. Nevertheless, people are still reluctant when it comes to buying bars for their kids. Some parents are too worried about gymnastic bars, because the Internet is chock-full of injury videos related to gymnastics bars. But manufacturers have made numerous improvements over the last few years, so new, sturdy bars are among the safest gymnastics equipment for home practice. This is the most important thing you need to look into, so naturally, it takes the first place. Even though every single bar below is sturdy, you have to know what its weight limit is. You don’t want to buy something that isn’t strong enough to support your little gymnast, right? Besides to the weight limit, the most important factor is the height of the bar. This depends on the age, and consequently the height of the child. Ideally, you should buy something that’s tall enough that your kid can use with no problems, but still being able to fit into your room. When buying a gymnastics bar, you have to learn to differentiate between weight limit and stability. Even the most stable bar will go down if the child is over the weight limit. That being said, you have to look for a stable model, because you don’t want your child to fall over while using the machine. I’ll start things off with the sturdiest bar on the list – The Tumbl Trak Junior will keep you relaxed at all times, knowing that your child is completely safe. What’s more, it doesn’t need any additional stabilizations or even plywood to support it. It can be set from 3 ft. to 5 ft. and has a solid weight limit. The best thing about it is that can be used at all levels and your child can use it to practices both cats and kips. It does take up a lot of space on the floor, so you’ll need a separate room to store it. 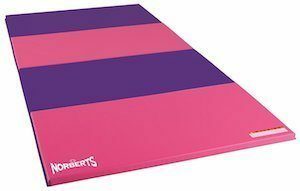 This Norbert’s model is perfect if your child is either completely or relatively new to gymnastics. This model will literally grow with the youngster – it can be set anywhere from 3 ft. to 5 ft. – so he or she will be able to use it for quite a few years. It’s made of steel tubing, so it’s really endurable and it can be used with a mat underneath. The weight limit is also quite good – children up to 100 pounds can use it. The biggest drawback, however, is that this bar isn’t designed for particularly big swings. 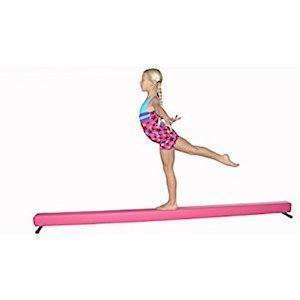 The last bar on our list this Nastia Liukin model that works great for advanced, more experienced gymnasts. It’s quite a simple product, it’s easy to assemble and your child will be able to start practicing mere minutes after it arrives. It’s endurable and will last you for a long time, since it’s made of fiberglass. Your child will have a lot of fun practicing handstands in the comfort of their room on it. If you’re not located within the United States, I’m afraid you won’t be able to order this bar, since it still only ships within the country. Beams are practically necessary for beginners, especially if your youngster is still in preschool. They are essential for balance and will allow your aspiring gymnast to learn proper handstands and cartwheels. Beams that lie flat on your floor are far safer than beams that are positioned a few inches from the floor. Using the latter will also result in quite a few bruises. On the other hand, your child will have a better feel of the beam if it’s positioned higher, so you should have a talk with them concerning the height. 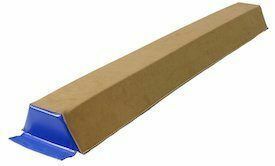 Traditionally, gymnastics beams are around 16 feet long, but chances are, you don’t enough space in your room to store it. You also have to be careful not to buy something too short that will prevent your gymnast from training properly. Traditional beams are usually made of leather, but home versions can be made from different materials. Luckily, you also some beams made of suede and wood that have a traditional feel to them. This suede beam is 2 inches high and has the classic beam width of 4 inches. As you probably noticed from its name, the top is padded with suede. That means it has both the look and the feel of an actual competitive beam. The advanced gymnast will have some use of it, since most of them prefer a beam few inches above the ground. But the beam isn’t really too high, so it’s pretty safe for home use, even on a hardwood floor. Three beams combined add up to 12 feet. This is more than convenient, because you’ll be able to easily store when your child isn’t using it. However, the additional beams will cost you, so it all comes down to your budget. It can be elongated up to 12 ft. If you’re living in a small apartment and you feel like you don’t have enough space in there for an actual beam, there are still options. For example, these sticky beam strips might be the perfect solution for your situation. The straps are exactly 8 feet in length and 4 inches in width, so they provide a nice replacement. Also, the Velcro strips can be stuck to your floor to simulate a real-life beam. Home mats are a must-have for any serious young gymnast and their parents as well. Let’s face it, our wooden floors don’t provide a lot of cushions. Even putting a thick rug on the floor won’t help the cause too much. If your child falls on the hard floor, in best case scenario, they’ll get a few bruises and in the worst case, they’ll suffer an injury. If you’re dealing with a newbie, you cannot even start shopping for gymnastics equipment without a mat. In any case, a mat will allow the youngest member of your family to safely practice handstands, cartwheels and rolls on your bedroom floor. It will even allow your child to jump and play around the room safely. Some mats are simply too thin. Naturally, they don’t provide too much cushion in case your child falls during practice. Conversely, if the mat is too thick, it will make practice too hard. You don’t need a mat that your child can sink in. This is a little bit tricky. You need to find a mat that will give your child enough space to operate during practice hours. However, you don’t want to buy something that’s too large to be stored in your closet. Some mats aren’t sturdy enough for advanced gymnasts. Advanced competitors need something more valuable that will be able to grow with them as they progress their skills. 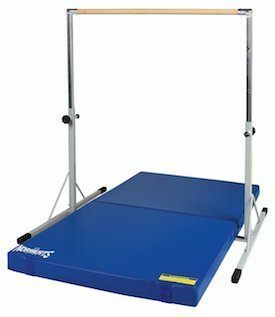 The Tumbl Trak Cartwheel Mat is perfectly suited for the youngest gymnasts. In fact, according to the manufacturer, children young as two-years-old will be able to use it. 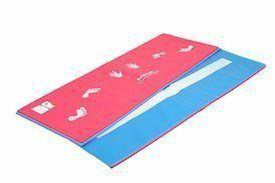 The mat has useful feet and hand placements, which allow the young guy to learn a proper cartwheel. Your child can also use it to practice handstands and rolls on it. When you turn the other side, you’ll find a line with the width of a beam on it. Therefore, your youngster will also be able to practice some beam walking on it. The colorful design will make a great addition to your child’s bedroom. There are several different designs and colors to choose from, so you and your offspring will have a blast picking the right one. 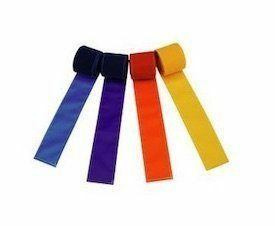 They come in standard gymnastics-mat-size and can be easily folded. The mat has Velcro strips on the end, so you can possibly purchase one more and link it to the old one. This is great because it will allow you to get a lot of mileage from the mat. The thickness is also perfect, so you won’t have to worry about any possible injuries. 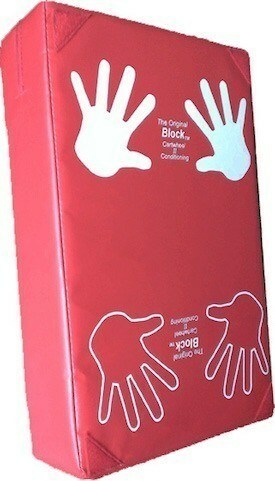 The last product here is a simple cartwheel block that’s great for teaching children how to do cartwheels. With this mat, your child will be able to learn how to do a cartwheel perfectly, without any assistance whatsoever. All your child need to do is place the block on the floor, put their hands on the prints, kick their feet to the side and voila – they are starting to lean. It will give them the right elevation they need to learn the cartwheel almost effortlessly. I should point out that before you actually start buying any actual equipment, you should consult your child’s physician. You should definitely see how much time he or she should spend practicing. As with any sport, injuries happen all the time, so you have to be as careful as possible. No one will deny that gymnastics is an amazing sport, but it’s also pretty demanding. According to NBC News, on average, child gymnasts spend 10 to 15 hours a week, practicing all year long. Shoulder aches are bound to happen but should be more worried about serious injuries. As Center for Injury Research and Policy reports, out of three million children who practice gymnastics, around 25,000 get treated for serious injuries in the US every year. Moreover, 40% of these injuries occur at home, where children bounce off couches and coffee tables. 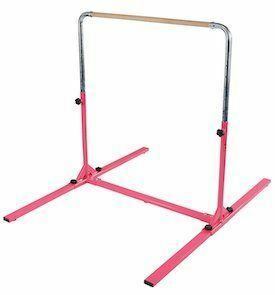 I’m sure you know understand why you should invest in proper equipment and gymnastic supplies for kids. This also means you’ll have to spend additional time with your child during their training sessions. After a while, they’ll be able to practice on themselves but once again, this all depends on their age. Talking to your child before you start ordering should be at the top of your list of priorities, right after speaking to a physician. This will guide your decision-making process and make things a lot easier. While your main aim will be to find the cheapest gymnastic equipment, you need to make sure that you pick the right-sized equipment. Some of the items we listed above were built for specific age groups, heights and weights. If you want your child to remain safe, check the sizing. Construction and materials are also pretty important, because the last thing you want is second-rate equipment. Cheap, plastic equipment will only increase your child’s chances of injuring themselves during training. You should also go out of your way to read some customer reviews before you order any equipment. Although, I’ve personally researched all of the items above, and I’m happy to say that all of them have great reviews on various sites online. With that in mind, we should finally take a look at some of the biggest benefits of gymnastics equipment. Home gymnastics equipment has a number of advantages. For starters, it will allow your child to practice disciplines and skills whenever he or she wants. As we already mentioned, without proper home equipment, most young gymnasts start using unsafe objects like furniture to practice. You should consider this as a long-term investment because it will save you a lot of money in the long-haul. You’ll save a ton of money on gas because you won’t have to travel to a gym on a daily basis. Plus, you won’t have to pay gym fees every month. I’m sure that you are aware that gymnastics equipment isn’t really cost-effective. Although the models I listed are all great, some of you might look for other options due to the prices of the equipment above. You will have to spend more than a few dollars if you want something high-quality. But you still have some options. 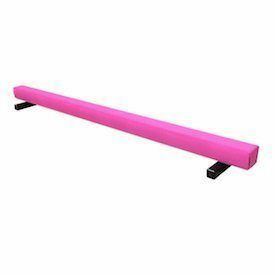 For instance, you can look for discounts and find used gymnastics bars for sale on various sites. Or you could you could find used cheer mats for sale on Craigslist or eBay. First, we have a store that sells basically every piece of gymnastics equipment you’ll possibly need. DGS also has some great gear, so you can give your child, even more, safety if you want. Lastly, the store also has top-notch mats, in addition to essentials like grips, bars, and beams. If you’re looking for folding and beam mats for your home, you can’t go wrong with Norbert’s store. The selection beam can also be a great addition to your home equipment. They don’t have many accessories, so if you want to fully equip your young one, you should look elsewhere. For those of you who are looking for specific manufacturers, this Amazon store should be your starting point. They have a wide range of equipment from different manufacturers from around the globe. This is perhaps the most convenient way of buying equipment of any kind, so make sure to check it out. Lastly, if you have a child that’s still learning the basics of gymnastics, you may want to speed the process. The best way to learn gymnastics is by watching expert, instructional videos. While YouTube is filled with “how to” videos on basically any subject, they are not made by seasoned professionals. Official instructional video tips and rudimentary instructions for newbies as well as exercises for children with some experience. They will help your child, regardless of their skill level. In addition, these videos are produced by famous instructors you wouldn’t have access otherwise. Steve Nunno, who’s recently made some headlines by returning to the Olympics is the star of my next video. Needless to say, most people in the sport consider him one of the best gymnastics coaches in the world. This video will take your child through various exercises, skills and progressions on each of the gymnastic disciplines. It’s great for figuring out gymnastics and learning the beginner exercises, your kid will be able to practice on your brand new equipment. The last place on my list is reserved for the most accomplished gymnast in the history of the United States - Paul Hamm. While the other two videos are specifically intended for either competitors or beginners, this one has the right balance. It will be useful for anyone, no matter their experience. Paul goes over essential floor exercises in this video. You can even buy this video before the equipment arrives, because it will help your child do exercises without the proper equipment. One thing is for sure, you won’t make a mistake with any mat, bar or beam I’ve listed here. Every single piece of gymnastics equipment for home mentioned here is of the highest quality. Other than these, you might need to find some gymnastics gear to perfect your skills. I recommend you go over the list a few more times, look at the features carefully, compare them and make an informative pick. Good luck and I hope you and your child will have fun picking and using the equipment.